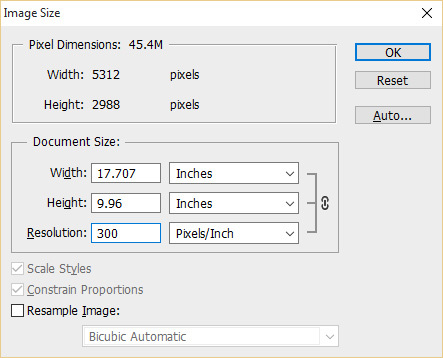 Image Resolution in Reproduction. How big can it go? Today cameras are everywhere. Almost every phone offered today includes a high quality camera built in them. From selfies to family portraits or even just a quick snapshot of your beloved pet can produce that one photograph you would just love to have blown up. But how big can it go? Image Resolution in regards to Reproduction is key. For the sake of our readers I will forgo taking a selfie and just use an example image at a resolution with an approximation of a 16M camera phone photograph (5312×2988). 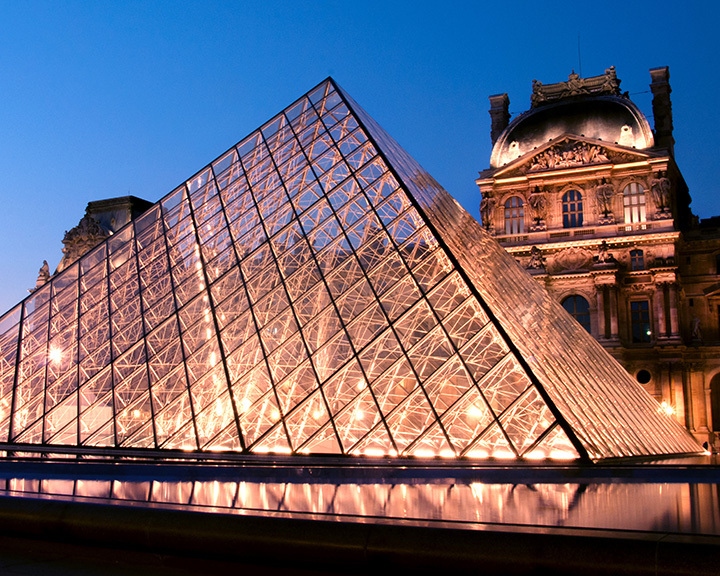 Let us use this image of the Louvre. 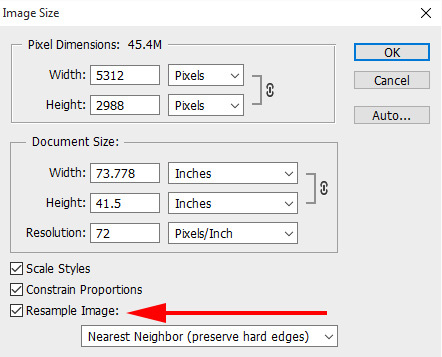 In Photoshop we can pull up the Image Size Dialog (alt+control+i on pc or command+Option+i on a mac) to see that our photo is a decent size at 73.778″x41.5″ at 72 dpi. this can make for a excellent print, but at what size? A good rule of thumb for standard photo viewing (2 feet or less) 300 dpi is more than acceptable, you can go higher if your image allows but keep in mind that at 10″ the average human eye in optimal viewing conditions cannot discern past 650 dpi. The further back your viewing distance the lower resolution can become acceptable. In the range of 5 to 10 feet 72 dpi is an acceptable resolution. Keep in mind these numbers are considered optimal for good lighting and weather conditions, low quality lighting and adverse weather will impair perception over distance. 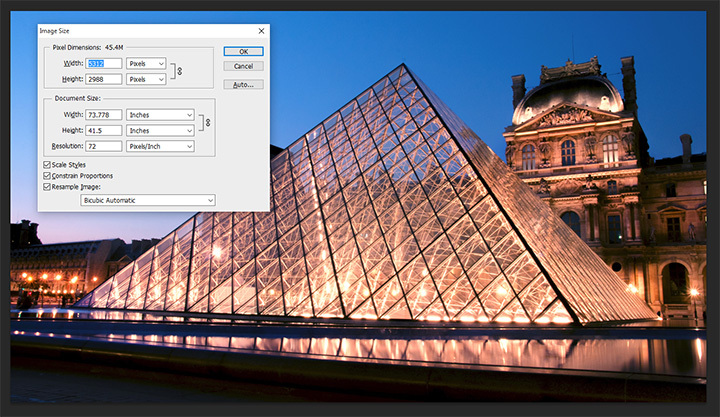 If we do not plan on cropping our image we can do this directly from the Image size dialog, with one minor change. 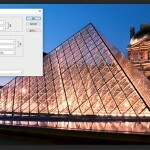 In the dialog there is a check box labeled “Resample Image”. While the algorithms for photo up-sampling are light years better then what they were years ago it still does not quite do the job for the quality outputs we are looking for, so we will uncheck this box. One thing you will notice is once you do this the editor for pixel dimensions is no longer editable, for this purpose this is a good thing. To see how this will reproduce at a nice photo quality 300 dpi we will enter 300 in the Resolution box. 17.707″x9.96″ not a bad size! However, we will want to frame this photograph and that is of course not a standard frame size. 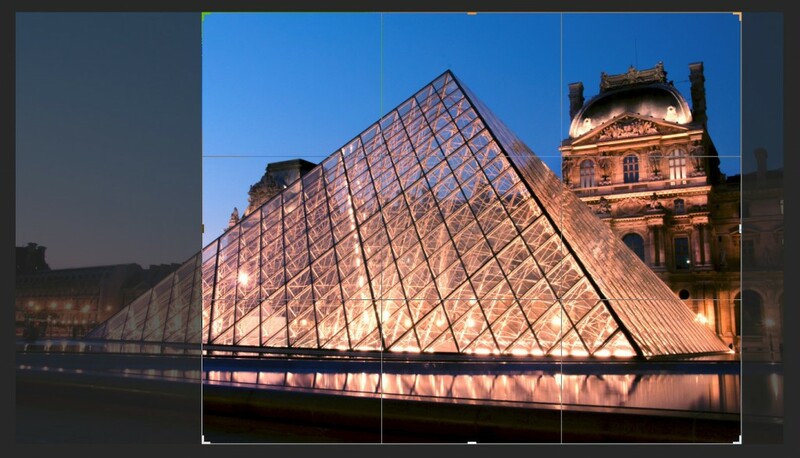 Luckily we can work with the crop tool to get our photo to a more standard size. Since we know that 17.707″x9.96″ is what our photo can be resized to with the same pixel ratio we will select a standard 10″x8″ for our size as that is a easily (and cheaply) attainable frame from any discount retail store. However, a 17×10 over-sized image can produce striking results! Printing on Poster Paper would be an ideal application! First we select our crop tool by pressing the “C” key. 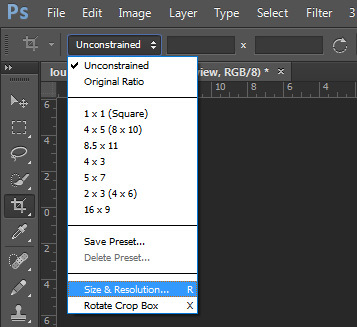 In previous versions of Photoshop the process herein was very intuitive, we would just insert our width and height in the top toolbar dialog while leaving our resolution blank. Later versions of Photoshop (CS6 is used as an example here) made this a little more complex than it needs to be in my humble opinion. 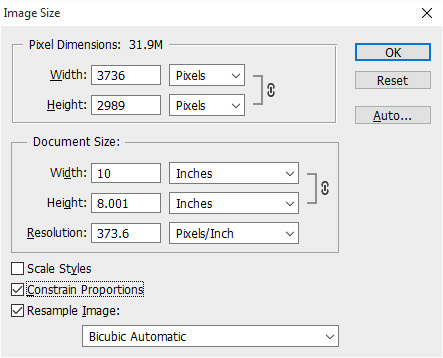 For these later versions we will have to select from our drop down menu and select “Size & Resolution…”. In this dialog we will enter our size of 10 for the width and 8 for the height. once we press ok we will see that our crop box has locked to a 10×8 proportion and we must compose our image for cropping accordingly. Once done we double check with our image size to see that our photo is 373.6 dpi. so more than enough for a good quality output!